Here you’ll find answers to all sorts of questions you may have about what I do. If there’s something you’d like to know that isn’t covered here – please feel free to get in touch. Details can be found on my Contact Page. Q. What materials do you work with? A. I work with wood, stone and slate and sometimes a combination of them. It’s quite expensive for me as I have to have a stock of all materials plus all the tools to work them – stone chisels, wood chisels and gouges, hammers, mallets, grinders, chainsaws… and an old tractor. Q. Is there anything you don’t do? A. If a client approaches me and asks me if I can do something in particular for them, I will nearly always say yes. As time has gone on I keep trying new skills and ideas and like to think I can manage most requests. I spent a weekend doing a blacksmithing course but I find I need to regularly put my hands on the piece that I am working on. Not a good idea with red hot metal! For that reason I don’t do much in metal but I do have a couple of good friends who are experts with metalwork so, if a job requires it, I can also provide this as a service. Q. What size of pieces do you create? A. From small, intiricate pieces for the home to large memorial stones and sculptures for the garden. These may be table-top wood carvings or slate, hand-carved clocks for indoors up to large pieces of furniture for indoors or garden use or chainsaw-carved wooden sculptures or hand-carved stone sculptures or memorials. Q. What kind of work do you enjoy most? A. I enjoy just about everything that I do. I was a graphic designer for many years so I really enjoy the creative process and I get a real buzz from producing something unique for a client and knowing I’ve created something that gives someone real pleasure. I enjoy the challenges of working on something intricate one day and then a huge outdoors piece the next. Letter cutting is quite a recent string to my bow and I love using my former design and typography skills to transfer text to wood or stone. A. I’m asked this a lot. I’m currently not geared up to be able to give tuition – it requires extra space, lots more tools, health & safety considerations, special insurance etc. However, teaching is something I’d like to turn to in the future so stay tuned. A. I don’t think so. I generally cost my work at about £25 per hour or £250 per day, probably less than your mechanic or hairdresser! I charge for materials at the price I paid, unless I already have stock which I sometimes don’t charge for at all. If a project is going to be very demanding on my tools then I may incorporate the cost for chisels, oil etc within my quote. I generally don’t charge a full rate for my time when delivering finished pieces but I like to have my fuel costs covered. However, nearly all my work is hand-crafted which can be very labour-intensive and will take time. I have to therefore charge accordingly. As a result, my work may be more expensive than having something produced by machine, but not always! Click here for a guide to my Pricing. Q. Do you work to a budget? A. I never have. Sometimes the material I start to work on doesn’t feel right and I discard it but (touch wood) I haven’t nearly reached the end of a carving and spoilt it. As mentioned previously, I work predominantly with wood, stone and slate. Below are overviews of the various types of materials I use and their uses. The larger carvings I do for gardens and outdoor display are usually done with a chainsaw and then finished off with power tools, where necessary. Quite often they will be from soft woods such as spruce, Scots Pine, Douglas Fir etc. However, I do also have large tree trunks of elm and lime and can get hold of others such as oak, although these hard woods will make the finished piece more expensive. For the smaller and more intricate carvings, I would use a type of hard wood. Depending on the piece, they can be lime, oak, fruit woods, tropical woods, reclaimed whisky barrel staves and even some mahogany offcuts I was given from a kitchen outfitter. My favourite wood to work with is Scots (or Wych) Elm. It has a lovely feel to it, is nice to carve and has a stunning ‘figure’ or grain, quite often with streaks of emerald green running through and the occasional burr to add extra character. I prefer to use locally sourced woods, usually wind-blown or reclaimed. However, I can source other woods if required. Please drop me a line if you have a particular preference. Wood samples These are just a few types of wood I use. Others are can be sourced if required. 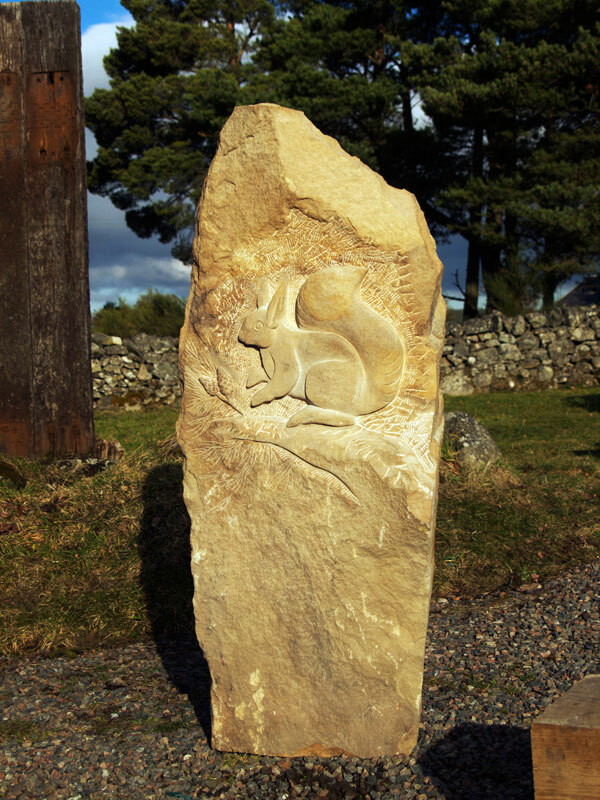 I use a local Moray sandstone for a lot of my stone and letter carvings. It varies in colour from a pale sand/biscuit colour to rich orange with deep russet, brown seams running through. 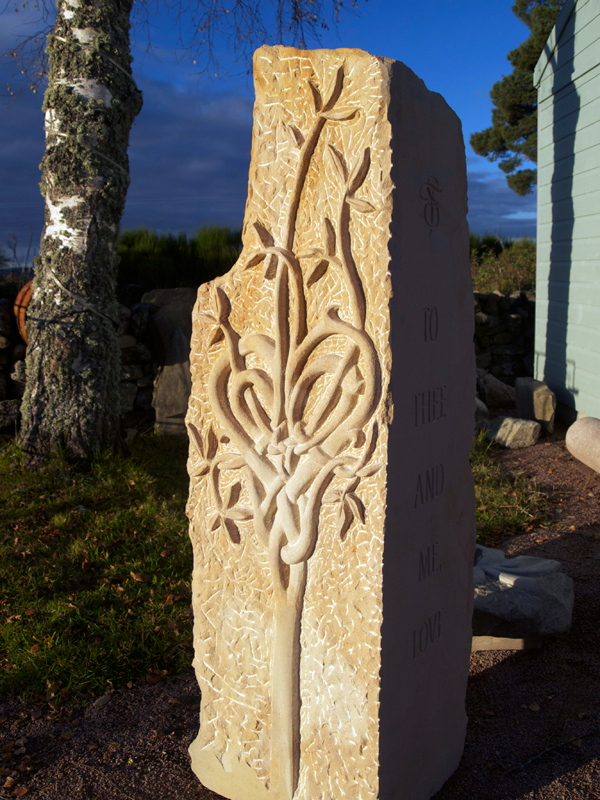 I also occasionally carve marble, limestone, granite, local Highland (almost indistinguishable!) field gatherings and pretty much whatever I come across. Each stone has different qualities, density, carving requirements and different stones will be used for different types of sculpture. The sandstone is great for garden sculptures and some lettering pieces but is porous and therefore can’t be used for a bird bath or water feature. Granite is extremely hard to work with hand chisels and so will lead to more expense for letter carvings for instance. Stone samples These are just a few types of stone I use. Others are can be sourced if required. A lot of my letter-cutting pieces are carved in slate. It is a great material for letter carvings as, when you carve into it with a chisel, it creates a much paler character compared to its surface. This means that it stands out much more for such things as house names, wall plaques, memorials etc. I often use Welsh grey slate but also some foreign slates. Some of these have the most vibrant colours running through them from mineral deposits in the seam which can help create an almost painterly quality to a carving. See my plaques and clocks gallery for examples, here . Another ‘slate’ I use quite often is Caithness. I put slate in inverted commas as Caithness is really a stone. But it does have similar qualities to slate when carved. It can be very brittle on the surface and can make the carving very challenging but it can be rewarding too. It also varies in colour and can have oranges, browns and greens running through. Mostly it is a mid or dark grey. If polished and oiled it can come out almost black. Work examples in slate These are just a few types of slate I use. Others are can be sourced if required. This overview of materials I use may help you when commissioning a carving. I produce pieces of work for myself to sell from my premises or through galleries, but the large majority of the work that I do is for private commission. I often prefer to work this way. The finished piece is truly unique but is also a collaboration between myself and the client, meaning that the customer has a hand in (almost) all the stages of the process. The process begins with a potential client getting in touch and expressing an interest in commissioning something. They may have an exact idea of what they would like but, quite often, they would like ‘something’ for a particular reason, event or special place; and are looking for creative guidance from me. I’m more than happy working with either scenario. My years as a corporate graphic designer have helped me to develop a skill in ‘second-guessing’ what a client might be looking for and I can usually come up with a design that fits the bill first time. The process starts with a discussion between me and my client; ideally it’s great to meet at my workshop because it allows you to see examples and materials for inspiration and clarifications, but consultations via telephone or email work just as well. In this first meeting, I’ll be seeking to understand your requirements, hopes and expectations of the piece you would like to commission. This is a chance for the exchange of ideas and although I’m always willing to give advice, I feel it’s important for you, as the client, to get involved in the process and provide as much input as possible. Nothing has to be decided in the first meeting – sometimes ideas take a while to settle, so we can discuss initial ideas, costs and a rough outline of your requirements and come back for further discussion once you have a clearer picture of what you would like to commission. Following the discussion, I will put together some sketches for your consideration and provide rough costs for the commission and the various options you may wish to select. The sketches are a jumping off point – nothing is “set in stone” and I welcome further clarification to make sure that wherever possible, I deliver exactly what you’d hoped for. I generally do not charge any fee for sketches or preliminary designs so long as it is agreed that the project will commence. If a project is cancelled without a good reason I may invoice for the time incurred working on designs. If the job is subsequently resurrected, these design costs will be deducted from the overall price. Once the design and materials have been confirmed, I will put together a final design and a cost estimate and suggested date of completion. At this stage I utilise my many years’ experience as a graphic designer and use design software to create a computer-generated “artist’s” visual. 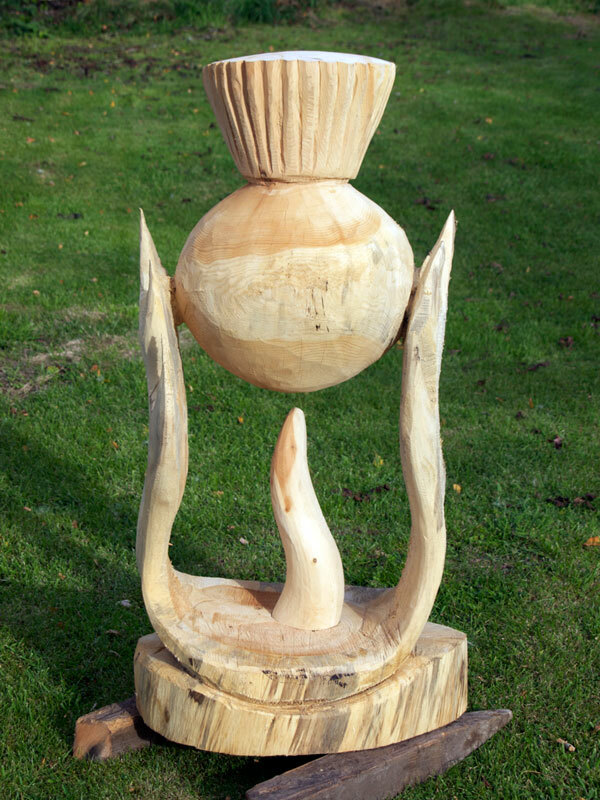 Quite often, this can be built around a photo of the actual piece of wood or stone that has been chosen by the client. This removes any doubt in the client’s mind as to how the finished commission will look. It means that there are no surprises when the final piece is seen for the first time! Once you are happy with these, an agreement will be made and we can move onto the next stage of the process. The cost will vary depending on the size of the piece, the material used, the amount of lettering and carving required and where relevant, installation costs may be incurred. See below for an outline of my costings. The production process will depend on the size, kind of piece and material used. “Roughing out” will often be with power tools such as cutters, grinders or a chainsaw. The detail is then hand-carved using mallets and chisels and gouges. All my letter work is also hand-carved using TCT (Tungsten Carbide Tipped) chisels (handmade in Scotland). The finishing process will include small files called rifflers and varying grades of sand paper. Wooden pieces are then given a good soaking with (usually Danish) oil or, on occasion (for smaller pieces), varnish. Some stone works will be given a protective coating also. The range of my work is wide and costs will depend on design, complexity, material, size etc. For this reason I like to discuss the project thoroughly with the client first so that I can ascertain all the factors involved. This will then allow me to prepare a reasonably accurate estimate for the job. Although I will always cost a project based on its own merits, here are ball park starting figures for the types of work I do…(prices for individual pieces may be seen alongside items in my portfolio). I am currently NOT VAT registered so VAT will not be added to my price. Once a price has been agreed changes, edits, change of materials etc are likely to incur extra costs. Once issued, I like to keep as close as I can to my estimates. If a job takes longer than expected I will generally not ask for more money. However, I may need to approach the client for more funds if something should happen that’s outside my control. Please see my *Terms below for more information. Once the design has been approved I will require a deposit before work can commence. This will confirm that the project is to go ahead but will also mean that I can purchase any materials required. The deposit amount payable will be at my discretion. Roughly speaking, for projects under £1,000 I will require a 50% deposit in advance. For projects over £1,000 the deposit may come down to one third of the overall cost. Unless circumstances change requiring extra funds, I won’t ask for the remainder of the costs until the job is completed, collected or installed. I always issue either an invoice or sales receipt. Once a commission has been completed, the client often asks to visit my studio to collect. Larger pieces can be arranged to be delivered and, if necessary, installed by me. During initial discussions I will determine where the finished item is to be delivered to and a price will be given and agreed upon before work commences. Please note, anyone commissioning a piece of work agrees to abide by my terms of business, below. Before starting work I will always require a written confirmation that the client is happy with the finalised design and that they wish me to continue with the project. An email will suffice or else I will ask the client to sign a commission agreement. A deposit will always be requested before I commence work. The design process is usually free of charge so long as the final project goes ahead. Should the client choose to terminate the project after requesting initial designs, a fee will be incurred for any design work completed at the daily rate of £300. Full and final payment must be remitted at the time of completion, collection, delivery or installation. I do not provide payment terms or credit. I am a small business and, like all businesses – my time equals money. Extra costs may be incurred for changes to design, material etc after a price has been agreed. I WILL pursue any unpaid monies through legal means. © All designs, sketches and photography are copyright of Stuart Murdoch. These may not be used in any way without express permission.